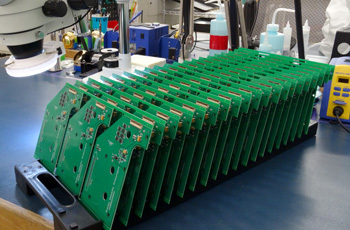 Our low to mid-volume production offering is a favorite among our customers engaged in prototyping activities. Many CM’s are not interested in this type of work, however it is a perfect fit for TouchPad. We process all of our assembly projects through our system the same way, enabling us to respond quickly for service parts or low to mid-volume needs. We can perform post process such as EOL test, programming and full box builds. You can expect the same high quality output and on-time delivery you have come to expect from our prototyping services.